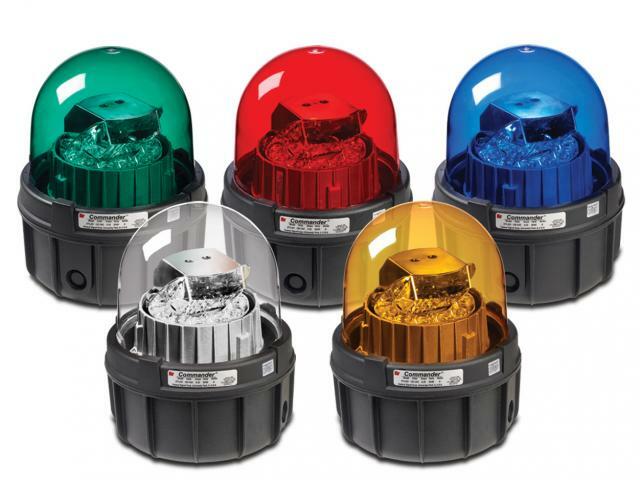 Model 371LEDX hazardous location warning lights have an array of 12 powerful LEDs arranged below a reflector. The reflector focuses the light from the LEDs into a high-intensity beam and rotates 360-degrees. The LEDs, reflector, and motor module are sealed under a polycarbonate dome which completes a water-tight, dust-tight enclosure. The dome and ring assembly simply screw on, providing access to the interior of the light. The 371LEDX base is hard coat anodized and features electrostatically applied black powder paint for greater corrosion resistance. Wiring can be routed through the pipe-mount opening in the bottom of the light or the two side knockouts can be used for side entry wiring. Installation can be surface or 1-inch NPT pipe mounted.